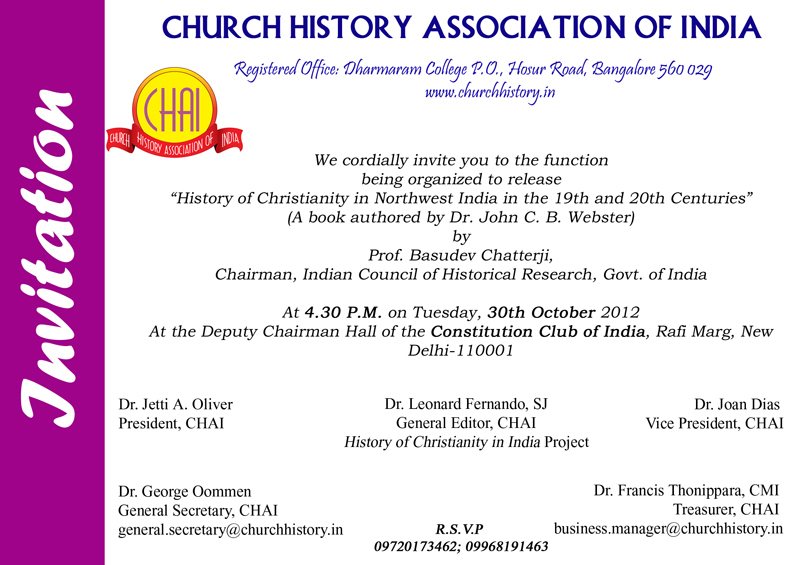 Kindly see the attached invitation for the Book Release of the latest book in the History of Christianity in Indiaseries of CHAI written by Dr. John C. B. Webster. The programme is on October 30, 2012 at 4.30 pm at the Constitution Club of India, New Delhi. We will be honoured to have your presence and blessings. "North West India in the Nineteenth and Twentieth Centuries"
Dr. John C. B. Webster: "North West India in the Nineteenth and Twentieth Centuries"
on October 30, 2012 at the Constitution Club of India, Rafi Marg, Behind Reserve Bank of India, New Delhi, 110001 at 4 pm..
All students and scholars of History, and Church History in particular are welcome. A history of the CHAI History of Christianity in India project - in the General Editors' own words. The story of writing that history was equally a chequered one. Volume II was published in 1982, and Volume I in 1984 (both reprinted 1989). Vol. IV, Part 2 in 1990; Vol.V, Part 5 in 1992. And Volume III in 1997." History of Christianity in India: Tamilnadu in the Nineteenth and Twentieth Centuries, vol. 4, pt. 2.